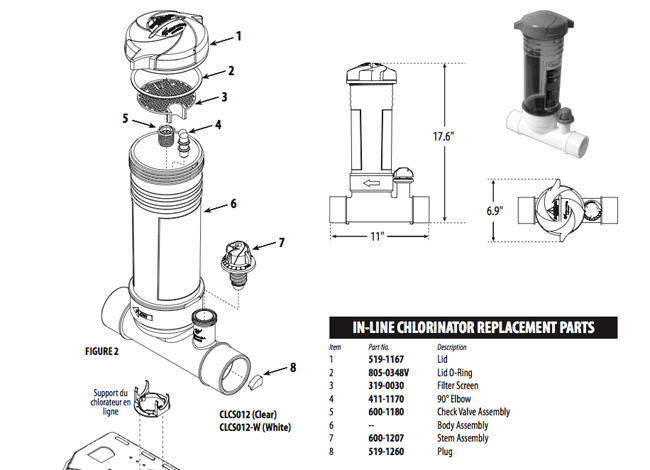 If you are looking to fix, or repair your Waterway Clearwater In Line Chlorinator, this parts cutaway diagram should help you identify the parts that you need to replace. Always make sure that you shut down your swimming pool filter system when you are working on your In Line Chlorinator or any other part of the poll system. As you can see, automatic pool chlorinator is very simple device that will handle the flow and amount of chemicals through the pipe into the pool. 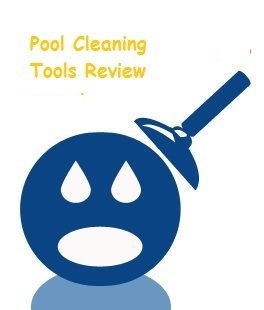 Usually a slow dissolving chlorine tablet will be used to sanitize your existing pool. With control valve, you can adjust the feed rate at your likes, and especially this in-line model is designed for permanent installation in the return line of the system with simple and trouble free mechanism and there should be no venting work required when install. When you add chemicals, you simply open the lid and add them from the top side. With regular 9 lbs size unit, you can allow enough chlorine to flow into the pool, and it will serve the average size pool for about 2 weeks. When it comes to the actual usage of the unit, there will be always a problem situation at any point of time. The most popular issues are with the amount of chlorine flowing into the water. If it’s too much, you might want to inspect if the pressure level and adjust it thus it can dissolve at slower rate. If chlorine tablets are not dissolving at all, then check if the dial on the side of chlorinator is turned up all the way. Another possible cause would be a locked air filled up inside. To be able to let the air out, you will need to remove the lid, turn the pump on, and screw the lid on after it is filled with water. Also look for other area that might fill up with air instead of water. At times the cycler lid is stuck on and wont’ move upward, or it doesn’t quite fit properly. You might want to check the lid o-ring and its size if it fits tightly. Lubricate it by applying soap or silicone lubricant on it. And check it at least once a year and replace the lid o-ring if it becomes worn out. A routine application of soap or silicone on the o-ring will enhance the durability of it. Do not just use any lubricants on o-ring because some products will ruin its texture and eventually break it down. Also check to make sure there are no calcium deposits on the lid itself. You can simply use screwdriver to get rid of them. Hi. I’d like to know how to remove the filter screen. I’ve tried to get it off to check the valve assembly and elbow for bloackages, but without success. My Waterway is mysteriously not dispensing any bromine at all! mine has same problem. there is a check valve in the dial. you have to unscrew the dial to get to it. i haven’t done it yet but i was advised that the pool place should have a replacement stem available before you start as it is prone to breakage. my filter screen just lifts out and is not attached. if the water runs out when you unscrew the cap it is not blocked in the container but in the dial. hope this helps! The control valve (stem) assembly has a rubber tapered bushing at the end of it to control the amount of water flowing into the body. It sometimes gets stuck and does not retract causing no water flow or chlorination. I just pried it out and will order a new stem assembly as the rubber bushing is not sold separately. The screen just pulls out.